In an interesting illustration of the state of journalism today, the news that three Raton city commissioners, including the mayor and mayor pro tem, were recalled Tuesday comes not from a newspaper, but from a blog by the wife of one of the recalled commissioners. Over 30,000 make the pilgrimage to Chimayo each Good Friday, many walking along the highways and backroads of Northern New Mexico for days. And more than 300,000 visit this “Lourdes of America” all seasons of the year, prayerfully seeking the curative powers of the “holy dirt” at the Santuario shrine. Discarded crutches and notes of thanks for answered prayers fill the little altar room dedicated to Santo Nino de Atocha. This beloved saint is said to wear out his shoes as he goes about the village at night, performing good deeds for the faithful. Shafts of filtered light illuminate pilgrims kneeling before the glass-encased figure of Santo Nino, the beloved local saint. Tiny replacement shoes are left here for him, and many more are lined up in the chapel dedicated to him across the road. But another breed of pilgrim journeys faithfully to Chimayo. This tribe comes seeking a different, but, they would say, related form of revelation that sparks the heart by means of the senses. The holy ground of Chimayo produces a chile that is sought as were the rare spices of old, with reverence, dedication, and intense passion. There is no substitute for Chimayo chile — and the faithful insist there is none better. Watered by the acequia that runs through the village, rooted in this particular soil, this chile’s thin-skinned, comparatively small crimson pods contain a sweet-hot fire that warms the tongue, the belly, and the soul. The elongated heart-shaped pod, recognizable by the curl atop its stem, like the crook of a staff, can take the chill off a cold winter’s evening or bring a cooling sweat to the brow on a sweltering summer afternoon. Along with small cannisters of holy dirt found in the Santuario, these seekers of true chile flavor bring home sacks of dried pods and bags of fine-textured, crimson Chimayo chile. Unlike the chile developed at the New Mexico State University Chile Institute that is grown commercially in Hatch, the Mesilla Valley and along the Rio Grande, Chimayo chile is a land race, descended from native seed. This chile has been grown by local folks for generations, passed down through the families, and traded with neighbors. In 2003, the Chimayo Chile Project was established to revive the local native strain. This seed is now available to local growers at the town feed store. As most chile grown here is consumed here, too, the best way to insure your purchase of genuine Chimayo chile is to make your own pilgrimage to Chimayo. There, in September and October, you can stroll up the path leading to the Santuario. The walkway is wide enough for a burro carrying a load of wood, or pilgrims walking side-by-side, and curtains of scarlet ristras drape the autumn sunlight and emit a pure aroma that nourishes both body and soul. The story of Chimayo is well-known. A local Franciscan friar and hermano, or Penitente brother, Bernardo Abeyta, while performing Good Friday rituals, saw a light emanating from a distance. He dug on the spot and found a crucifix of Our Lord of Esquipulas, a Guatemalan religious figure. The crucifix was brought to the nearby Santa Cruz mission, yet, miraculously, it reappeared in the spot where Abeya originally found it. This happened three times. Finally, in 1816, Abeyta built the Santuario to honor the vision. The well of holy dirt is located today where Abeyta saw his vision, and the crucifix rests behind the altar. The name, “Chimayo” is derived from a Tewa word, “tsi mayoh,” meaning “hill of the east.” And the “posito,” or well of holy dirt is said to be located on the spot of hot springs — now dried up — where indigenous people made pilgrimage. No wonder that even the skeptical have reported feelings of deep spiritual connection here, often to their own surprise. Chimayo may be approached from many directions. It is located 40 miles south of Taos, 24 miles northeast of Santa Fe, and ten miles from Espanola up Hwy. 76. A journey down from Taos can take you along the winding High Road, past the remote villages of Truchas, Vadito, Penasco, where very little has changed over the centuries since the Spanish settled here in the 18th and 19th centuries. Descendants of original land grant families still dwell here, practicing the old ways. Many live off the land, cutting wood, growing and preserving apples and corn, bartering, and making what they need with their own hands. While the shops on Santuario Lane around the shrine sell delicious sun-dried Chimayo chile as a kitchen ingredient, you can satisfy your appetite for local cooking on the spot at nearby eateries. Leona’s, located directly to the left of the Santuario, is a modest, reliable and friendly “hole-in-the wall” that serves delicious authentic chile. Leona is famous for her fresh, hand-made tortillas. A bit more upscale, and just down the lane and to the right, is El Rancho de Chimayo, a beautiful, classic Northern New Mexico restaurant that has long been in the Jaramillo family. The sopaipillas with honey are divine, and there’s nothing better than a margarita by the fireplace in winter. It’s a comfortable place for a special date or a family gathering. 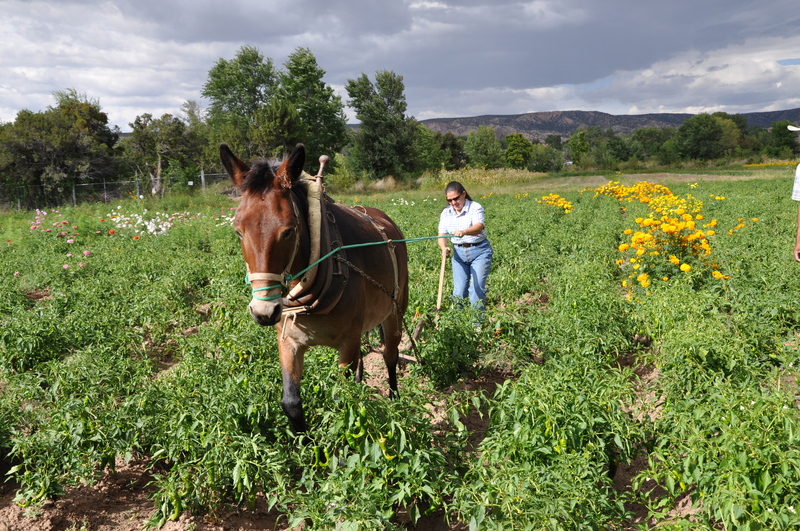 Patty Albritton, a Chimayo native, farms her grandmother’s six acres on the Canada Ancha acequia with the help of her partner, Angel Reyes, her grandson Kaeden Albritton, and a mule named El Macho. 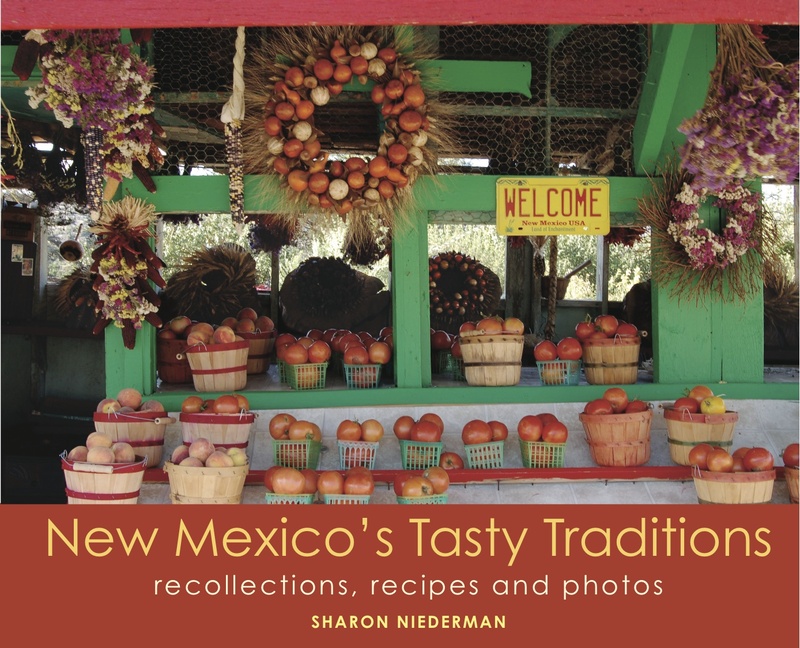 They grow native Cimayo chile, corn for drying and roasting to be preserved as “chicos,” sweet peas, onions, and flowers for the colorful dried arrangements and corn decorations they make by hand to sell at farmers markets in Los Alamos and Taos. They believe the old-fashioned plow drawn by El Macho controls soil erosion and weeds better than a tractor. Rinse chicken and dry well. Cut into small pieces. Peel garlic and slice finely. Slice onion. Heat oil in large frying pan over medium heat. Add a pinch of salt, garlic and onion. Fry over medium heat until onion becomes translucent. Add lemongrass and chile. Fry 1 to 2 minutes until fragrant. Add chicken and cook until lightly browned. Add fish sauce, sugar and caramel sauce. Mix well. Add 1 cup water and cook 45 minutes, or until chicken is tender. Stir occasionally and add more water if necessary. Taste and correct for spices. Serve over rice. Serves 4. Mix 1/2 cup sugar with 4 tablespoons of water in heavy saucepan. Bring to a boil over medium heat and let boil until mixture changes color. Turn heat down to low and heat until brown. Add 1/2 cup water to mixture. Stir until sugar is dissolved. Remove from heat and store in a jar in the refrigerator. Drain beans, reserving cooking liquid. Melt lard in a heavy skillet over medium heat. Add beans and lightly fry them in the lard. Set aside. Melt bacon drippings in a large heavy pot over medium heat. Add onion and cook until it is translucent. Combine sausage and the beef with all the spices up through the oregano. Add this meat-and-spice mixture to the pot with the onion. Break up any lumps with a fork and cook, stirring occasionally, until meat is very well browned. Drain. Add water only if necessary to maintain the consistency of a chunky soup. Stir in all remaining ingredients. Bring to a boil, then lower the heat and cook. Taste when curiosity becomes unbearable and courage is strong. Adjust seasonings. Serve with corn chips, shredded cheese, sour cream, guacamole, grated onion, and more beans. Great for football watching on wintry Sunday afternoons. Patty may be reached at aprcreations@yahoolcom. Brown the ground round over low flame in a heavy skillet. As meat is browning, toast chile pods lightly in cast iron pan or the oven for about 10 minutes, or until fragrant. Seed and stem the pods. Cover pods with boiling water about 10 minutes, or until softened. Place pods in blender jar about 3/4 full. Add 1 cup cold water and blend about 5 minutes. Mince the garlic and saute. Add blended chile and 1/2 teaspoon salt and bring mixture to a boil.Lower heat, cover and simmer about 15 minutes. In a well-greased 9×13 pan, layer tortillas, cheese, drained beef and onion and top with a layer of red chile. Do this until ingredients are used up. Sprinkle top with grated cheese. Bake until bubbly in 325 degree oven, for about 20 minutes.